In stock 146 items in stock. 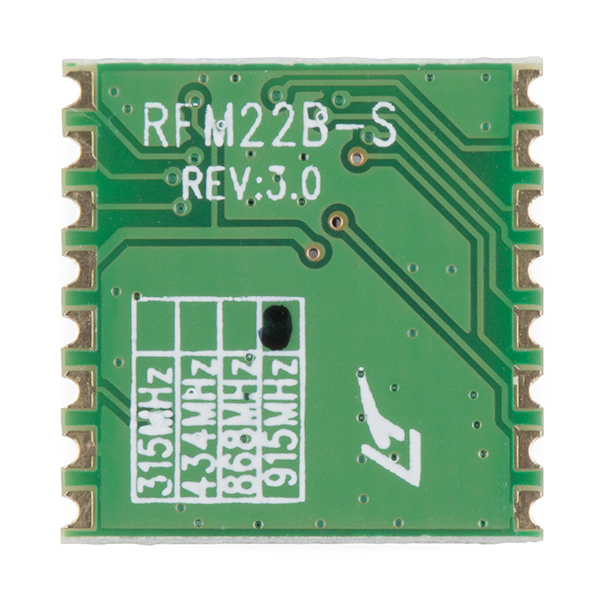 The RFM22B is a low-cost ISM FSK transceiver module which offers communication at 915MHz ISM and adjustable output power of up to +20 dBm. The wide operating voltage range of 1.8–3.6 V and low current consumption makes the RFM22B an ideal solution for battery powered applications. 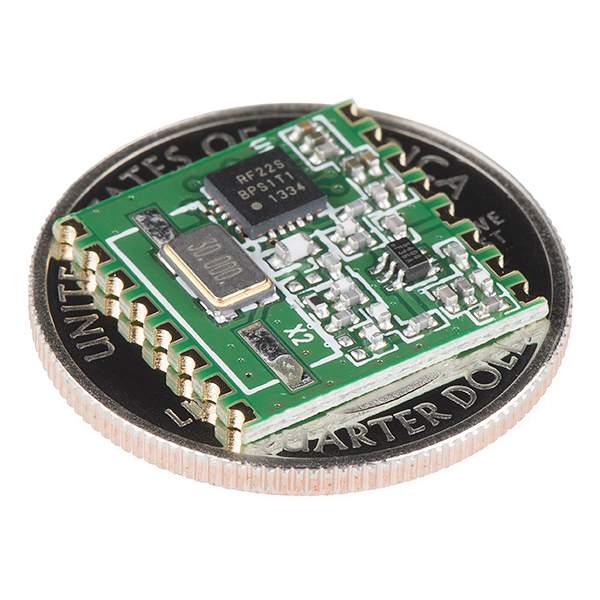 The module comes in a 16-pin, 16 x 16mm, SMD package, with pins spaced by 2mm. 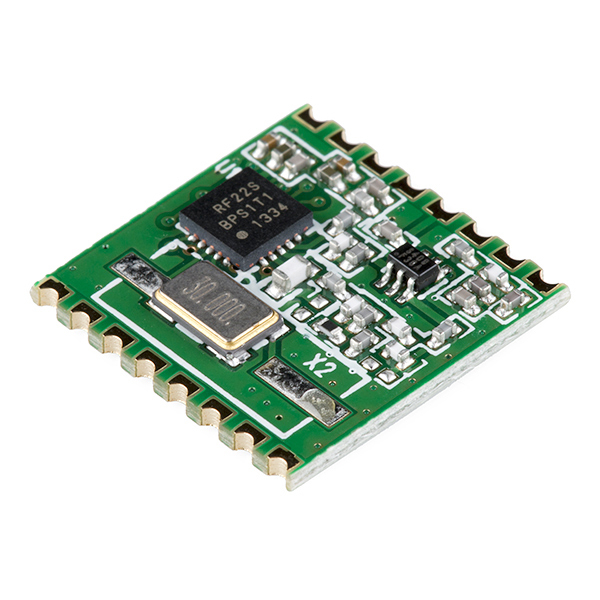 Note: These modules are 915MHz and Rev3.0. To answer the gentlefolk below the rfm22b will indeed tune the full range of the device. OTOH the LC filters on the output are tuned to a specific frequency block. On the back of the device it is marked as such. The device works great but would benefit from a breakout board. I ask Sparkfun to make the same board available that is use with the 434 MHz version. They very pointedly said a big "NO". There is an Australian firm on ebay that does sell a bare BOB for this. I got two and they work great. The 33 cm band is open for this FCC part 15 device. I give this HopeRF a big 5 stars **** for this device since I cannot "review" the device. Hi, the data sheet says the device supports from 240 MHz up to 915 MHz, why the device is announced to be working on only 915 MHz. Thx. Hi, I have this working with an arduino uno, but I dont know how to connect this to the arduino pro micro. Especially teh NIRQ wire.....Please help me! Serious noob question: How am I supposed to connect this to anything? I've soldered headers onto bob's and attached them to breadboards but the 2mm spacing on these prevents this. The shape of the 2mm connectors seems to be meant to connect to something specific. I'd like to attach this to a breadboard or some other type of prototyping environment but don't know how. Should I just solder wires with pins to the 2mm connectors? 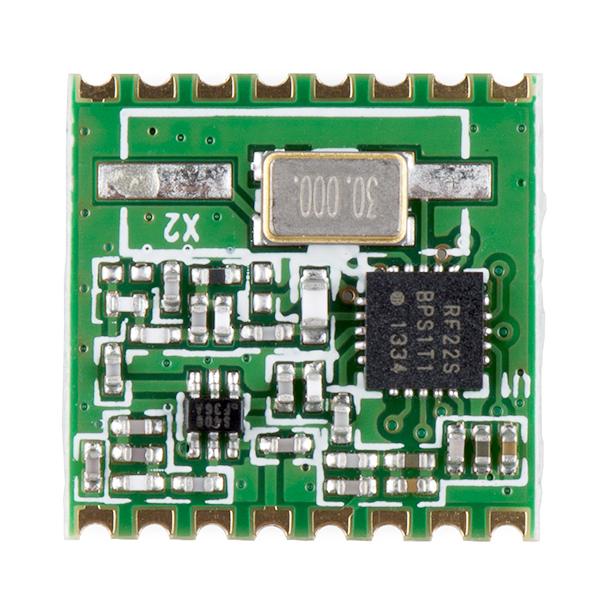 Noob question: Can you "bind" this transceiver with another one so that other connections will not interfere or interrupt like an rc plane? If this transceiver was on the same frequency range (915Mhz), could it communicate with the RFM12B with little or no differencre from communicating with it's "own kind" - or vise versa? Comparing the two datasheets, it seems that they may work together. The RFM22B will need to be in FSK modulation mode. Both will need to be on the same carrier frequency, have the same frequency deviation, and same bit rate. I have purchased both modules and I hope to test this out this weekend. Honestly though, the RFM22B is so much more flexible and totally worth the extra few dollars, in my opinion; it will save you a headache to just get the RFM22B. Anyone know if these will detect the presence/absence of a 915Mhz carrier? If so, then you have my full attention because that's the transmission mode used by my electrical meter. It would be real nice to monitor power usage wirelessly, but I haven't been able to find anything handling carrier/no carrier transmission other than possibly GNU Radio. Seems like everything in that band is FSK. Yes! OOK [On-Off Keying], which is one of the three modulation modes this module uses, is a type of amplitude-shift keying modulation which does exactly what you want it to do. Wonder if you can take a strip of breakaway headers pull every other one and solder them on with those divots and make it look nice while at it? I can tell you that it is possible... it doesn't look particularly nice, though. I did this on a few of the 434 MHz transceivers so they were nice and 0.1" spaced, but in all honesty, it was ugly and made the transceiver stand about .5" off a breadboard. It seemed to work better than soldering jumper wires to each pad, but it's far better to use a BoB or design your own pcb with the correct spacing. Let me know if you want photos of my attempt on the 434 MHz module. Has any kind of real life range testing been done? Would be nice to know how far these could really go. Again, YMMV, so err on the side of caution if a wireless link is crucial in your project. Nice! Is the range effected in any way? If you are referring to the 915 MHz freq. vs 434 MHz, chances are that the range and penetration will suffer slightly due to the higher frequency. The difference may not be noticeable if you use this in an open-air environment, but generally, higher frequencies are reflected more easily than low ones and require more power to cover the same area as a transmitter with a lower frequency. I am happy with the modules. Using Radio Head libraries it worked first attempt.